While I am waiting for my more fun photos from my weekend to finish uploading, I thought I’d write up a quick post on cost of living hear in Xiamen. The trip was largely successful. I got all the essential things I needed plus even a little bit of Chinese honey. To top it off I learned how to say sugar as well. But the most interesting part is the translation of price. Below is a picture of every thing I bought. 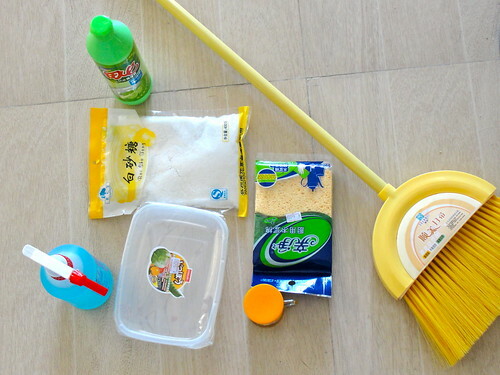 Not a whole lot, but plenty of useful things windex, dish soap, sponges, sugar, Tupperware, honey and broom . My guess in the US it would have run me anywhere from 25-35 dollars depending on how much a broom like that costs and the quality of the honey. Either way, it all ran me exactly 50 RMB. For those of you with out a calculator handy or that don’t know the exchange rate, that’s a whopping $7.35. More interesting post coming of sight seeing as soon as all the pictures are done!